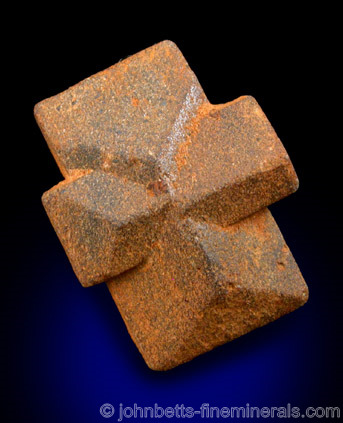 Staurolite is best known for its distinctive, cross-shaped penetration twins, where two rectangular crystals intersect each other to form a perfect cross. 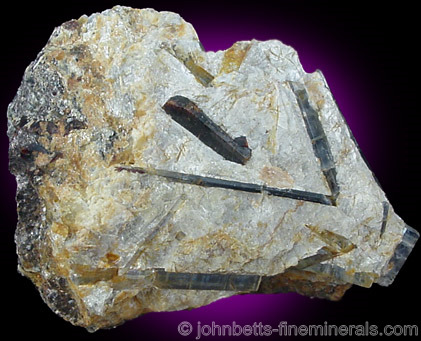 However, its most common twinning habit is in bisecting crystals with a 60° angle that can appear in the shape of an "x" when the crystals are elongated. 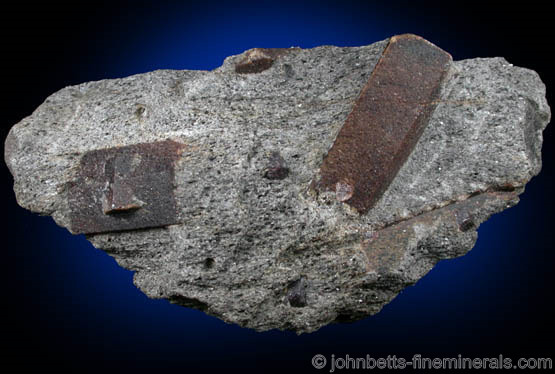 Although Staurolite does form in single, non-twinned crystals, the twinned habit is much more prevalent. Some of the bulk "Fairy Crosses" or Fairy Stones that are sold in tourist areas are dyed or ground down to make the pitted texture smooth. One should be aware of these whenever buying from bulk sources. In general, overly smooth crystals are usually ground or cut. 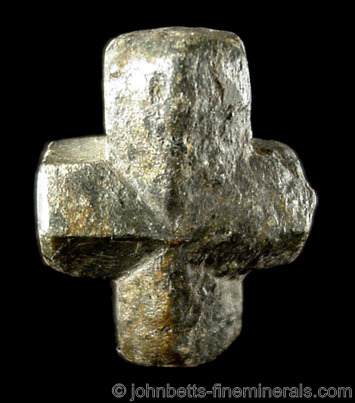 Staurolite is named from the Greek term "stauros" which means cross, in reference to this minerals frequent twinning habit. Crystal texture is commonly pitted and rough. 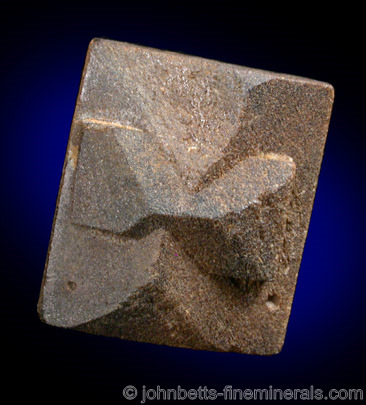 In pseudo-orthorhombic crystals, usually in rectangular form with a hexagonally-shaped cross section. 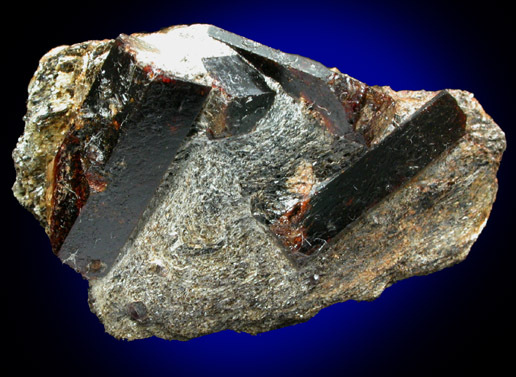 Crystals often have a triangular formation on the termination. Crystals are usually prismatic, but may also be short and stubby, as well as tabular. 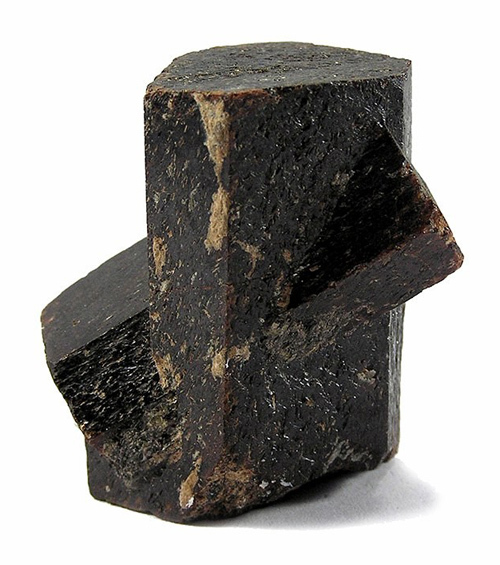 Most often in penetration twins, in the form of perfect perpendicular crosses (sometimes known as staurolite twins), 60° penetration twins, and occasionally even in triple-twinned, star-shaped combinations. Also in groupings of several crystals, and in twins where a smaller twinned crystals appears to be swallowed by a larger one. 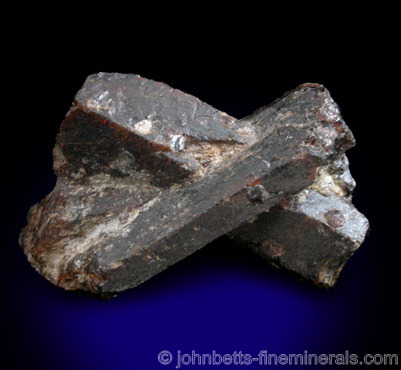 Basic aluminum iron silicate, often with magnesium and sometimes with zinc and lithium. In metamorphosed schists and gneisses. 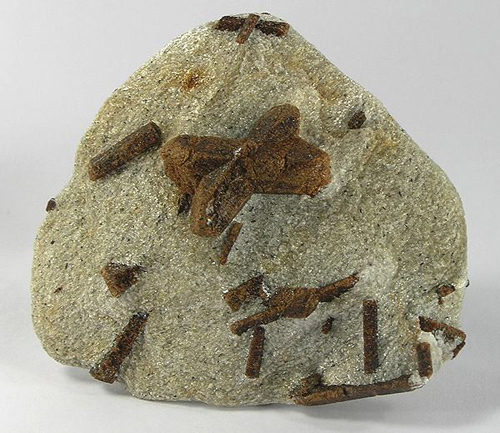 - Twinned crystals of Staurolite that form in a cross-shaped formation. Also known as a Fairy Cross. 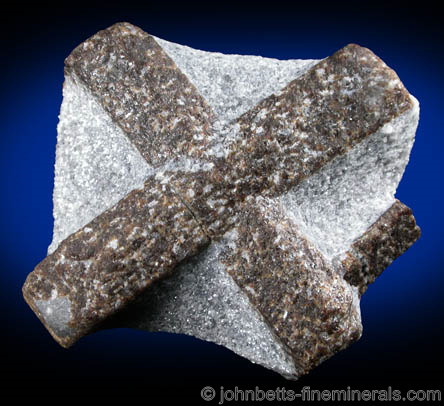 - Magnesium-rich variety of Staurolite. First described as a new mineral species by the IMA in 2003. 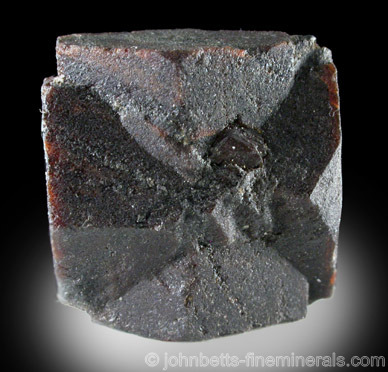 - Zinc-rich variety of Staurolite. First described as a new mineral species by the IMA in 2003. 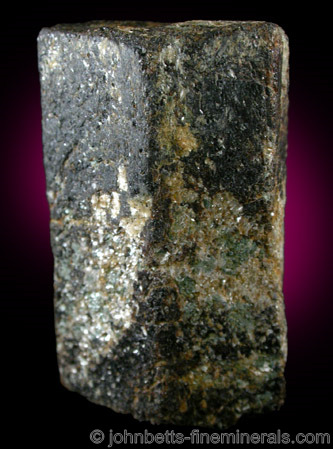 A classic Staurolite locality is Pizzo Forno, Ticino, Switzerland, where elongated crystals were found in matrix associated with Kyanite. Staurolite floater crystals, sometimes with good translucency, come from the alluvials of Brittany, France, at Baud and Finistère. Small grayish floater crystals were abundant at Fanzeres, Gondomar Municipality, Portugal. In Russia, very large Staurolite crystals in silvery mica and often well-trimmed matrix come from the Keivy Mountains, Kola Peninsula. Small twinned crystals are also abundant at the following worldwide localities: Cattle Creek, near Mount Isa, Queensland, Australia; Antananolofotsy, Betafo District, Antananarivo Province, Madagascar; and Rubelita, Jequitinhonha valley, Minas Gerais, Brazil. 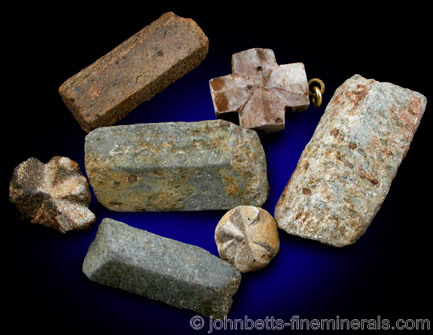 In the U.S., single and twinned floater crystals have come from Windham, Cumberland Co., Maine; and well formed crystals from Pond Hill, Lisbon, Grafton Co., New Hampshire. Fairy Stone State Park, in Patrick Co., Virginia is named after the twinned Staurolite crystals that are found there. Blue Ridge, Fannin Co., Georgia, is a famous locality that has produced an abundance of single and twinned floaters. Twinned crystals, including rare sixlings, have come from the Hondo Canyon, Taos Co., New Mexico. 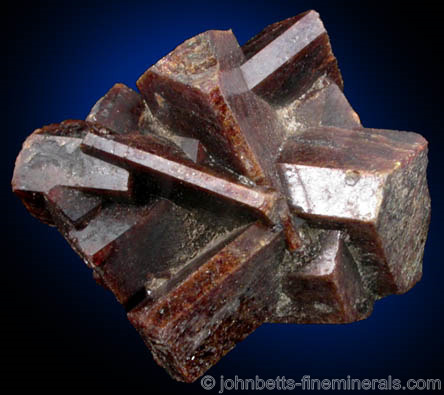 Andalusite - Has different crystal habits, and doesn't form in the typical Staurolite twinning patterns.